In a gruelling five-round title tiff, reigning ONE Bantamweight World Champion Bibiano “The Flash” Fernandes of Brazil turned in a gutsy performance, overcoming a spirited effort from ONE Featherweight & Lightweight World Champion Martin “The Situ-Asian” Nguyen of Sydney, Australia to win via razor-thin split decision. The action was electric all throughout the bout, with both men having their moments. Although Nguyen landed the harder, more telling blows, Fernandes was the busier ma and performed slightly better overall with his takedowns and accurate combinations. In the final frame, Fernandes pulled away just slightly, outworking Nguyen over the last five minutes of the contest. In the end, the Brazilian did just enough to retain his title in front of a packed Impact Arena crowd. The victory cemented Fernandes’ claim as the best in the world at bantamweight, earning him a record eight title defenses to remain the most dominant ONE world champion in history. In the co-main event of the evening, Jeremy “The Jaguar” Miado of the Philippines overcame insurmountable odds, knocking out former world champion Dejdamrong Sor Amnuaysirichoke in the first round. In a wild exchange of punches, Miado clipped Amnuaysirichoke with a thunderous right cross, sending the Thai hometown hero crashing to the canvas as the referee waved off the contest immediately. Shannon “OneShin” Wiratchai of Thailand authored one of the most dominant performances of the night, reinserting his name into the winner’s column with a quick knockout victory over Singapore-based Indian martial artist Rahul Raju. Wiratchai only needed 21 seconds to shut the lights out on Raju, landing a hard right hook to clinch the scintillating knockout. With his impressive conquest of Raju, Wiratchai earned the GoDaddy Knockout of the Night. In a clash of talented female atomweights, Angelie Sabanal of the Philippines captured a hard-earned victory, routing Thai rising star Rika Ishige via unanimous decision in her ONE Championship debut. Sabanal and Ishige kept the action focused primarily at the center of the ONE Championship cage for the majority of the bout. The Filipina newcomer showcased her pinpoint accurate striking early on, peppering Ishige with stinging kicks and stiff punches. Although Ishige boldly traded strikes with the Filipina kickboxer from bell to bell, the latter pulled away in the final round, landing the more telling blows. In the end, Sabanal earned the undivided nod from the three judges at cageside. 23-year-old Saygid Guseyn Arslanaliev reignited his meteoric rise through the ranks, defeating seasoned Japanese veteran Tetsuya Yamada by submission. Both men started out aggressively, but it was Arslanaliev who showed a more capable set of both striking and grappling skills throughout the three-round lightweight match. As Yamada avoided trading strikes in the stand-up, Arslanaliev spun a web of crafty grappling on the ground to overwhelm the Japanese veteran. Driven to score a finish, Arslanaliev was able to get the submission in the third round, making Yamada tap from a wrenching belly-down armbar. 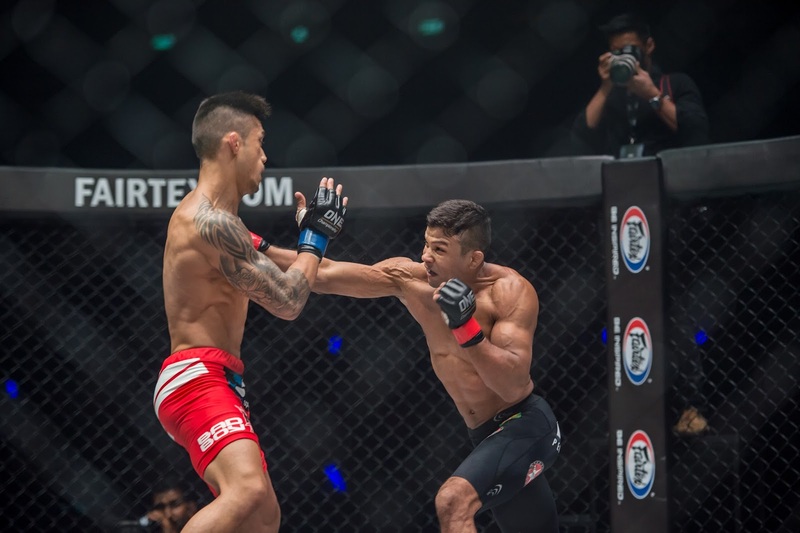 Pakistani martial artist Waqar Umar made an astounding statement in his return to the ONE Championship cage after nearly two years of absence, submitting Chinese prospect Zhao Zhi Kang in the first round of their featherweight clash. With a game plan to take matters to the ground, Umar got the job done by fastening a rear-naked choke to force the tap from Zhao. American submission wizard Garry “The Lion Killer” Tonon impressed in his highly-anticipated ONE Championship debut, toppling Filipino lightweight Richard Corminal in his maiden assignment wearing four-ounce gloves on the premier martial arts stage. The Brazilian jiu-jitsu superstar put forth a dominant striking performance, unveiling a new dimension to his evolving skill set by putting together dynamic combinations. In an offensive clinic against his Filipino counterpart, Tonon overwhelmed Corminal with punishing strikes from the get-go, blasting his opponent with rocking right hands and cracking kicks. In the second round, Tonon took matters to the ground and quickly got mount, finishing Corminal with a pair of elbows. Kritsada “Dream Man” Kongsrichai made quick work of the Philippines’ Robin Catalan to continue his winning ways inside the ONE Championship cage. Opening up the contest by taking the action right to Catalan, Kongsrichai pounced on his Filipino opponent with a series of powerful strikes, including solid knees from the clinch. As he pushed Catalan constantly back up against the cage, Kongsrichai wrapped his arms around his foe’s midsection and took him for a ride with a belly-to-back suplex. Catalan was deemed unable to continue when he landed on the mat, forcing the referee to wave it off and declare Kongsrichai as the victor by way of stoppage. Multiple-time kickboxing world champion Alain “The Panther” Ngalani placed himself back on the winning track by edging out promotional newcomer Ariunbold Tur-Ochir of Mongolia via split decision. Both men gave fans a spirited effort over three rounds, which featured a healthy stream of action from both corners. After a gruelling contest, it was Ngalani who walked out with his hand raised in triumph. Gilberto Galvao of Brazil spoiled the much-awaited return of Jake Butler to competition, defeating the decorated American wrestler by technical knockout in the second round. Galvao finished the job in the opening sequence of the contest’s second frame, checking a low kick from Butler with a hard knee. As Butler dropped to the canvas, he held onto his leg and hit the ground writhing in pain, the referee stepped in and called a halt to the bout, awarding the victory to Galvao. A three-round bantamweight encounter served as the curtain-raiser for ONE: IRON WILL as “The Terminator” Sunoto battled it out with Malaysian standout Hisyam Samsudin. Leaning on his impeccable grappling, Sunoto burned out his opponent, consistently bringing Samsudin to the canvas and controlling the action with crisp ground strikes. With a dominant top game, Sunoto notched his second consecutive victory in 2018, defeating Samsudin as all three judges saw the bout in favor of the Indonesian to win by unanimous decision.